In his first address on foreign policy two months ago, presidential candidate Donald Trump explained that one of the key strategies missing in United States foreign policy was unpredictability. If elected President, Trump charged, it would serve for him and the nation as a great asset in foreign affairs. Trump’s call for unpredictability echoes a central tenet of President Nixon’s foreign policy strategy. 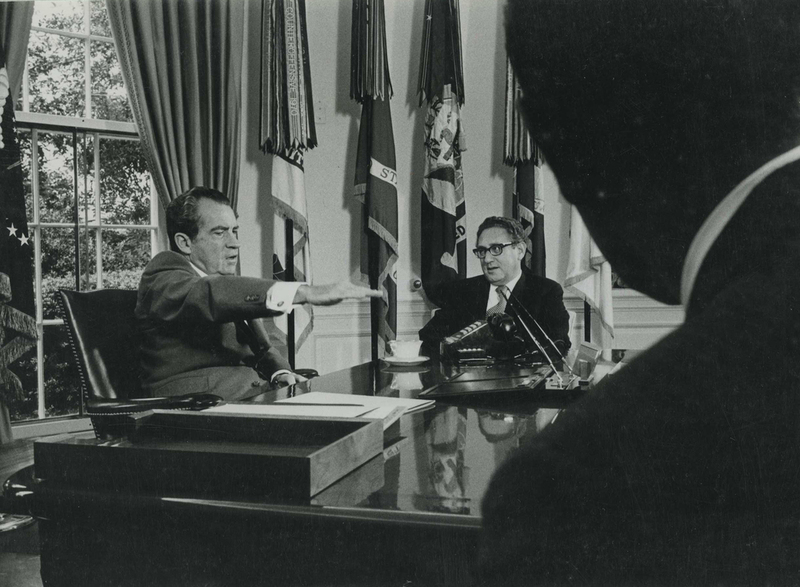 Nixon’s experience in the field of foreign affairs, from his days on the Herter Committee as a congressman to his around the world tours as vice president and later as president of the United States, taught him countless lessons regarding the strategies of negotiating with foreign leaders, particularly adversaries. One of those lessons was the usefulness of poker and the game’s demand for unpredictability. President Nixon applied this philosophy in his efforts to bring the United States’ involvement in Vietnam to an honorable end – the “small pot” in the case of the poker analogy. Ever the intransigent foe, the North Vietnamese perpetually hounded American efforts at diplomacy despite the latter’s intentions for a reasonable peace (phased troop withdrawals, Vietnamization, offers of multi-party representation at the peace talks). One particular decision in May 1972 to bomb high profile military targets in Hanoi and to mine the Haiphong Harbor, demonstrated President Nixon’s resolve to achieve these goals. When North Vietnam launched an invasion of the South and later disregarded U.S. overtures in 1972, President Nixon’s decisive military actions in December of the same year forced the North Vietnamese to the negotiating table, culminating in the Paris Peace Accords of 1973. During the Yom Kippur War, President Nixon encountered a situation where unpredictability and an established credibility served as his greatest assets. The war pitted two Middle East giants, Israel and Egypt, against each other in an intense three-week struggle. It not only threatened to absorb the region in destructive conflict, but brought on the most serious crisis in superpower relations since the Cuban missile crisis. At the most pivotal diplomatic stage in the conflict, after Israel had pushed back Arab forces with the help of the United States’ crucial airlift operations, president of Egypt Anwar Sadat requested that the United States and the Soviet Union enforce a ceasefire agreement by sending ground troops to the region. President Nixon flatly rejected this proposal for he saw it as a ploy by the Soviets to solidify their influence in the Middle East. In response, Soviet General Secretary Leonid Brezhnev relayed a scathing letter to President Nixon stating that if Sadat’s requests were ignored, the Soviet Union would enforce the ceasefire unilaterally. Seeing this as a bluff by Brezhnev, President Nixon raised the alert level of the U.S. military to DEFCON 3, meaning an increase in force readiness above that required of normal readiness. It was the highest such rating since October 22, 1962 at the height of the Cuban Missile Crisis. The president readied Air Force strike units and re-deployed two aircraft carriers to the Mediterranean, showing that by all means the United States would counter Soviet attempts to exert their influence in the region. Indeed, on account of his precedent set in Vietnam, the Russians believed that Nixon was certainly capable of putting his words to action. They immediately called off troop deployments in the Middle East and a crisis of an exponential magnitude was avoided. Nixon’s credible unpredictability played a pivotal role in a potentially explosive crisis in the Middle East, ultimately influencing geopolitical relationships while simultaneously initiating a path to peace in the region (e.g. Egypt’s pivot to the United States) . As we look forward to the crises of today, when various forces threaten to undermine peace and stability in the world, it would serve political leaders well to study the full range of President Nixon’s foreign policy strategy, in both the small pots and big pots.